Over this span of time, other services that depended on modems for the transmission of data have been replaced by broadband connections to the internet. Through your Internet Service Provider (ISP), you can access any web site that may provide practical services to you personally or for your business. Few people still connect by modem to send and receive emails and surf the web, or at least this is what I thought. 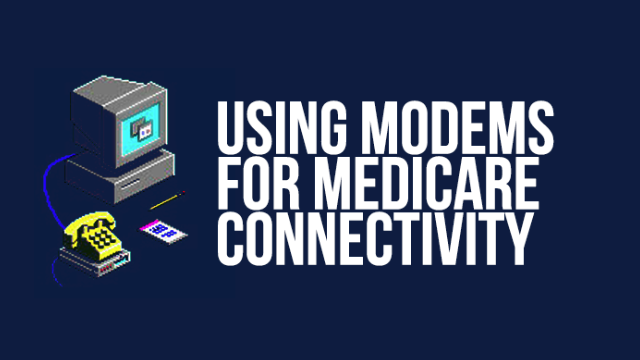 Back in the spring, one of the MACs, First Coast, which supports Florida Medicare providers, announced that they were discontinuing the support of modem connections. They contacted their providers and suggested that if they still used modems, that they contact one of the recommended vendors on their web site that provided connectivity services. We were one of several vendors listed. During April and May, almost 100 Florida providers signed up for our services as a replacement for their existing modem connection. Some of them that I talked to told me that they currently did not have internet access and would have to contract with a local ISP to get it. They seemed to be genuinely upset that they were being “forced” into using the internet. I was surprised, to put it mildly, that these modem connections still existed and that so many providers conducted their business either without internet access or access through this primitive technology. It is difficult to say how many of these connections still exist nationwide or how many were present in Florida. My experience represented only our contact with the providers that reached out to us, other listed vendors undoubtedly experienced a similar influx of new Florida business. Originally, modems provided a cheap alternative to ISPs which used to be more expensive than they are now and whose services provided less scope and value when the internet was new and less content was available. It is difficult to imagine how any business would be able to live without internet access, especially a business like healthcare delivery that depends on current information and conducting financial transactions electronically. If you are a provider and you have purchased broadband internet access, but are still using a modem for Medicare connectivity, you are probably paying more than you would be to maintain this technology than you would pay to abandon it. In addition, this type of connectivity creates problems that are not present through internet access. Vendors like MEDTranDirect are listed on each MACs website with contact information on how to obtain their services. Some even offer free trials to their customers to evaluate this connectivity option. These vendors maintain high quality leased line connections to all of the MACs and then provide connectivity through secure web pages between the provider and their own systems directly connected to Medicare. Medicare has always been wary of the internet and they do not provide access to their systems directly to providers through this technology. They instead allow vendors like us to distribute access through these connections as long as they are secure. Modems require a phone line that must be available exclusively for use when the connection is active. In many situations, this phone line only exists for use of the modem, if the modem is eliminated, the line and its associated cost can be eliminated as well. Modems are mechanical parts of your computer and will eventually fail. When this happens, they will have to be replaced. Modems have become increasingly expensive and difficult to maintain as their use continues to decline. Broadband connectivity is infinitely faster than a modem connection and much more reliable. Phone line noise is often responsible for corrupted files and disconnects during your Medicare access sessions that can be responsible for hours of extra work recovering from these incidents. Modems and the software you use for connectivity is often installed on a specific computer. This means that you must have access to this computer to connect with Medicare and if the computer fails to function, is being replaced, or is unavailable, your connectivity is down until the new system can be installed and accessed. Internet access to Medicare is done through secure web pages. No extra software needs to be installed on any particular PC to provide this access. This means that you can connect to Medicare through any computer with internet access. If you internet connection goes down, you can access the internet from a different location or provide backup access through any smartphone or Starbucks. The same technology that connects you to the rest of the world, should be connecting you to Medicare as well. Recently, Novitas has issued several emails regarding the status of dial-up connectivity problems with their systems. Providers and their agents using modems to access this MAC system are not only experiencing problems connecting to this system, but have had files corrupted because of problems with the quality of the connection.